24 Jan 2017 Washington, D.C.
“I would not have made that decision to run that,” Gray told Breitbart News on Tuesday when asked if she would have run either the BuzzFeed story containing the dossier or the previous CNN piece on live television and online which aimed to lend credibility to the dossier without actually publishing it. Gray does still consider Smith a mentor and a friend, however. Gray’s decision to speak out publicly against her former employer, BuzzFeed, is noteworthy considering she was one of the top newsroom employees there. She also, in her new capacity as a reporter for The Atlantic, delivered one of the earliest and strongest hammer blows against Smith’s and CNN’s decision to publish the dossier, discrediting BuzzFeed and CNN. 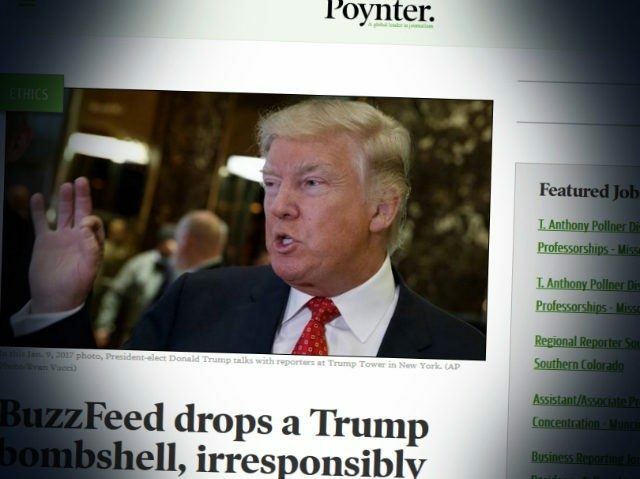 “It Is Fake News Meant to Malign Mr. Trump” read the headline on Gray’s exposé debunking BuzzFeed’s report on a supposed intelligence document alleging a number of salacious things about Trump and his team. “Michael Cohen, an attorney for the president-elect has denied allegations contained in a dossier published by BuzzFeed News,” Gray’s sub-headline in The Atlantic reads, further blowing up the now-discredited BuzzFeed scoop. Reached by telephone on Tuesday night, Cohen denied the dossier’s allegations. The story is ‘totally fake, totally inaccurate,’ Cohen said. ‘I’m telling you emphatically that I’ve not been to Prague, I’ve never been to Czech [Republic], I’ve not been to Russia,’ Cohen said. ‘The story is completely inaccurate, it is fake news meant to malign Mr. Trump.’ Cohen said that during the time the report places him in Prague, he was actually with his son visiting USC and meeting with the baseball coach. Gray, unlike BuzzFeed, actually called the source of the allegation to ask him if it was true before she printed it. And she called the University of Southern California, too, to verify that claim — and they confirmed it. A USC baseball source confirmed Tuesday night that Cohen and his son had visited USC on August 29th. Cohen said that he was in Los Angeles from the 23rd through the 29th of August, and that the rest of the month he was in New York. He said that his only trip to an EU country over the summer had been a vacation to Italy in July. In one instance, the dossier places the alleged Prague travel in ‘August/September 2016.’ Cohen said he was in New York for the entire month of September. Gray is part of a group of discredited ex-BuzzFeed staffers who fled the publication in a recent mass exodus. Andrew Kaczynski, who was a lead researcher for BuzzFeed, went to work for CNN. And McKay Coppins, the largely discredited BuzzFeed scribe who inaccurately profiled Trump before he ran for president in a hit piece claiming Trump would never run for president, joined Gray in traveling to The Atlantic. Among other mistakes that BuzzFeed allowed its reporters to make, Coppins also inaccurately reported the fake news that Breitbart News was funded by Donald Trump during the campaign. BuzzFeed’s Smith, Gray’s old editor, has not immediately responded to a request for comment on Gray’s decision to admonish her old employer’s irresponsible editorial decision-making. CNN in many ways was worse than BuzzFeed in what they did on this front: While CNN did not actually publish the document, anchor Jake Tapper and reporters Jim Sciutto, Evan Perez, and Carl Bernstein lent enormous credibility to the source of the document without verifying any of the now discredited allegations. The episode resulted in a very public blowup for both CNN and BuzzFeed, as at Trump’s first press conference as president-elect earlier in January he blasted CNN’s Jim Acosta–who broke journalistic norms in his attempts to interrupt the then-president-elect–as working for a “Fake News” outlet. Trump also blasted BuzzFeed as a “failing pile of garbage” during that press conference. Gray confirms publicly she would not have made the same decision as Smith or CNN, but then tries to rationalize it in an unhinged Tweet-storm. 2/ I called Boyle for a story I'm working on. He won't cooperate, he says, unless I publicly denounce BuzzFeed for publishing the dossier. 3/ I tell him that while I wouldn't have made same decision to publish, I won't do what he's asking me to do. 4/ There was no "decision to speak out publicly," I can tell you that much. btw you guys would get a kick out of my recent text exchanges with Matt Boyle, let me put it that way.